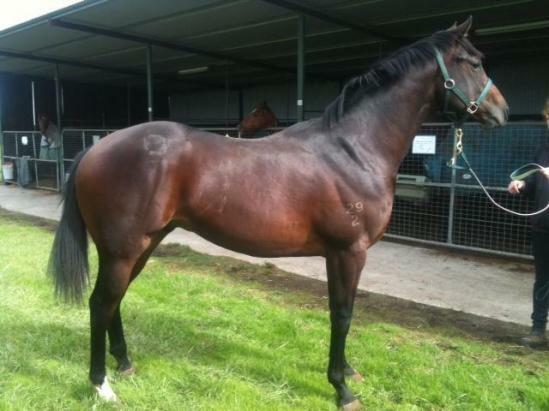 BUSHRANGER (IRE) (Bay 2006-Stud 2010). 4 wins at 2, Newmarket Middle Park S., Gr.1. Sire of 420 rnrs, 181 wnrs, inc. SW Mobsta (Curragh Greenlands S., Gr.2), Ridge Ranger, Now or Never, Ross Castle, Serseri, Jerilderie Letter, Inferno, SP Faithful Creek, Fox Trotter, Bushalem, Direhorse, Langavat, Majestic Alexander, Riverboat Springs, Waylay, Siir Gibi and of Benz, Ideal Approach, Mount Isa, Bushcraft, Outback Traveller, The Character, etc. Chopsticks (g. by Bushranger). See below. Jeune Affair (g. by Jeune). Placed in Aust. Colonel Bradley. 5 wins from 1400m to 1900m, Avondale JC Desert Sun H., 2d Gore Cup, 3d ARC Trelawney 7 Cups H., Jacobsen Headstones H.
DESTRUCTION (Fastnet Rock). 4 wins-2 at 2-at 1000m, 1200m, A$151,125, to 2015-16, BRC Dalrello S., L, ATC Power Access 2YO P.
Outrage (Zerpour). 4 wins from 1400m to 2000m, CJC David Emerson H., Speight's H., 2d CJC NZI H., The Informant H., Supporting Cystic Fibrosis H., Otago RC Coupland's Bakeries H., 3d CJC Spring Classic H., L, Racecourse Hotel H., 4th Hororata RC South Island Thoroughbred Breeders' S., L.
Saved by the Bell. 6 wins from 1600m to 2400m, NZ$102,803, Pakuranga HC Meredith Connell H., ARC Bidvest H., Newmarket Rotary Club H., BOP RC Rawhiti Hort H., 2d ARC Dunstan Feeds Championship Qualifier, Counties RC NZ Spinal Trust H., 3d ARC Irish Raceday at Ellerslie H., Kiwi Bacon H., Terenzo Bozzone H., Simpson Electrical Merchants H., BOP RC Gartshore Construction H.
FORK TONGUE (Twig Moss). 4 wins. See above. Pretty Plume (New Regent). 4 wins-1 at 2-to 1200m, MVRC Sherwood H., Hollymount H., SAJC Last Tycoon H., 2d VRC Bloodhorse Breeders' P., Gr.2, 3d VRC Waltzing Lily H., L, 4th SAJC Lightning S., Gr.3. Producer. GOLD CITY (Gold and Ivory). Champion Older Female Miler in NZ in 1996-97. 8 wins from 1200m to 2150m, NZ$66,175, A$423,780, VATC Eclipse S., Gr.3, VRC Matriarch S., L, Waipa RC Galilee S., L, 2d VRC Australian Cup, Gr.1, Hardy Brothers Classic S., Gr.3, Waikato RC Windsor Park Sprint H., L, 3d VATC St George S., Gr.2. SIOUX CHIEF (Noalcoholic). 10 wins-1 at 2-to 1550m, A$150,208, STC Darby Munro H., L, 2d VATC Spring P.H., L, 3d QTC Sir Byrne Hart S., Gr.3, AJC Carbine Club S., L, Newcastle JC Cameron H., L.
JACQUELINE ROUGE (Ne Coupez Pas). 6 wins-1 at 2-from 1000m to 1600m, A$423,000, Qld Tatt's RC Tattersall's Mile, L, VRC Veolia H., 2d VRC Maybe Mahal S., L, 3d QTC Dane Ripper S., Gr.3. Producer. KABLAMMO (Marauding). 10 wins from 1200m to 2100m, A$331,550, VRC HKJC Melbourne Cup Day P., L, AJC Spring Country Cup, STC Luskin Star Welter H., 3d AJC Hall Mark S., L.
CELEBRITY GIRL (Starcraft). 3 wins-1 at 2-to 1100m, A$191,638, VRC Cap d'Antibes S., L, SAJC Redelva S., L, MRC Slickpix 2YO H., 3d VRC Edward Manifold S., Gr.2. GENERALIFE (Lonhro). 9 wins-1 at 2-to 1400m, A$858,345, ATC Star Kingdom S., Gr.3, 2d MRC Kevin Heffernan S., Gr.3-twice, 3d BRC Doomben Ten Thousand S., Gr.1, Stradbroke H., Gr.1, VRC Yellowglen S., Gr.3, MRC Moonga S., Gr.3. Race Record: 2 Starts 0-0-1 A$2,500.